I was half way through my steady state run yesterday. The heat index was 103 and I had to take a break in some shade. “Yes – thanks” was my reply to the voice that seemed to come out of nowhere. “It’s hot out here today”, I said as I looked around to see who was talking to me. It was some nice people sitting outside on their porch. I must have looked as bad as I felt at the time. However it only took about 2 or 3 minutes to gather my composure and start back on my run. I had been dreading this day for some time. Six weeks out from our marathon and we are now starting our workouts. TJ sent me the schedule and I had mistaken that yesterday was to be a tempo run and not a steady state run. So, being hot out and a bit worried I wouldn’t get through, I set my iSmoothRun app and went out for my run. Looking back on it, it wasn’t as difficult as I thought it would be. My first mile was slow as I warmed up. My achilles has been a bit sore, so I didn’t want to go too fast. 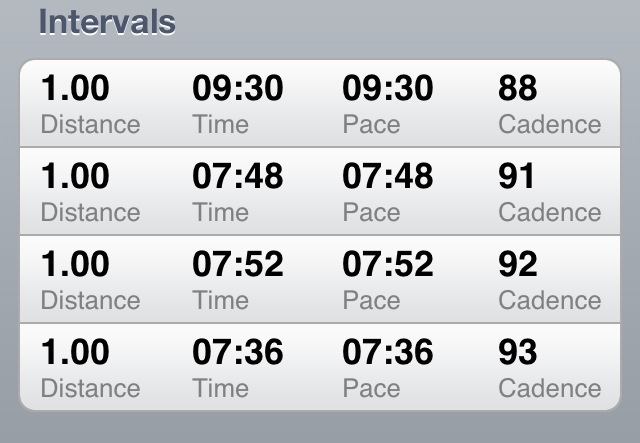 After that I went straight into my steady state pace. I am supposed to keep my pace around 8:00, but with the heat, I set my app to 8:30 just to be on the easy side. I didn’t listen to my app. This morning I woke up with a sinus infection. That, along with only 4 hours sleep means I will have to take the day off from running today. Oh well. Better safe than sorry!!! This entry was posted in Marathon training, Running, Steady state run and tagged Marathon Training, running, training. Bookmark the permalink. ← I ran mile 16 – 18 yesterday! You are a machine running in 103 degrees! Amazing! Great job!! Clad to see the confidence bud. 6 weeks and a cloud of dust. Get at it! Ha. Don’t know about the dust part, but thanks!!! Thank you. I am on my way to the doctor in a bit. Rest should help… I hope so anyway. Wow, I’m impressed with your time, especially in the heat. Someday I’ll be able to run that fast. I’m thinking by this time next year I will. Keep up the great work! Thank you. I did take a couple breaks, but I was happy overall. I wanted to do more, but I didn’t want to be stupid in the heat. Anyway. Thanks for the encouragement. You’re too kind!!! Thanks. I need to feel better tomorrow as our 5K is Saturday. I was just getting in the groove and have been out 2 days with this infection. Oh well. Could be worse!!! You’re right!!! I didn’t totally understand that until I started running (your blog helped too).